The Peralta Adobe is San Jose's oldest house, being built in 1797, it is the last remaining structure from El Pueblo de San Jose de Guadalupe. An outside cooking oven, called a horno, can be seen in the picture to the right, and when you enter the small home, with its two rooms, you will see how it was to have lived here back then and just use your imagination to see how you would have liked it. Just think of the Gonzales and Peralta families that live here for much of their lives. Behind the small adobe home, the Fallon house can just be made out, which was built in 1855 by one of the city's earliest mayors, Thomas Fallon, who was a frontiersman with John C. Fremont's expedition. The Victorian mansion contains 15 completely furnished rooms that were quite typical for that period. Carmel Fallon, Thomas's wife, was the daughter of one of the most important landowners in the territory. The adobe home was built by Manuel Gonzales, an Apache Indian, and is 20 feet wide, and 41 feet long, split into two equal rooms. The walls are around 2 feet thick and made of adobe blocks, being built by a market plaza in early San Jose. It wasn't special, but indicative of the type of houses that were built by citizens during that period, but has become very special as it is the only kind of house like this in the city. Manuel, his wife and 5 children came to the territory in 1776, with the Anza Party. Manuel was one of the founders of the early settlement that sprang up in the area, in 1777. This was the second home that Manuel built, because the first had been flooded in the winter rains. In 1804, he passed on, and the house became the property of Luis Maria Peralta, who was soldier and one of the owners of one of the biggest ranches in the state. Luis came with his father, who was a corporal, and the rest of his family with the Anza party and was one of the 15 families that received a pardon in 1778. Luis reached 21 years of age and had to join the military of the king of Spain, and married Maria Loreto Alviso in 1784, transferring from Monterey to the mission at San Jose; as corporal of the guard at the mission Santa Cruz. In 1805, Luis took the entire garrison from the fort at San Francisco and went into the San Juaquim Valley chasing after the Indians that attacked the mission at San Jose. He surprised the Indians in their village, winning a quick victory and raising his reputation and stature many notches. He became a sergeant and was put in charge of the Pueblo San Jose in 1807; becoming the highest military and civil figure in the region. He stayed in that position until 1822 when Mexico became independent of Spain. Alamo Rental Cars have always been one of the BEST companies to do business with. Now Alamo Printable Coupons are waiting for you to save even more money. The Alamo Coupons are making all Alamo customers very happy, so go to the Alamo web site and click on the Alamo Printable Coupons button. The REM or Rosicrusian Egyptian Museum was started by the Ancient Mystical Order Rosae Crusis in a museum about ancient Egypt in the Rosicrucian Park in the Rose Garden neighborhood of San Jose, California. The order still supports and helps the museum grow with numerous educational and scientific activities. The founder of the order, Dr. Harvey Spencer Lewis collected different artifacts of mystical symbolism, with some from the far East. In 1921, he donated money to the archaeological digs at Tel el Amarn, which had been the capital city of pharaoh Akhenaten. By doing this, he was given a few Egyptian antiquities for the collection. 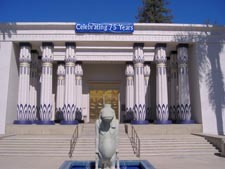 In 1928, he gave the public a collection he called the Rosicrucian Egyptian Oriental Museum that were being held at the administration buildings of the AMORC in San Jose. He then went on a tour of Egypt in 1929, gaining many more relics and donations for the collection which grew to have over 2000 exhibits. His son, Ralph Maxwell Lewis, became the second imperator of the organization and wanted to build a place for the museum's collections, which opened in November 1966. At that time, the museum had become unique in that it contained; the biggest exhibition of ancient Egyptian antiquities in the western United States, was also the only museum in the world that had structures built in the ancient Egyptian architectural style, had the buildings set in an Egyptian revival park and had a purpose built planetarium next to it. It was the 5th planetarium opened in the nation and the first with a star projector. One of the notable exhibits that begin in 1999, was the Women of the Nile, with accompanying lectures that travelled across the country and Canada, continuing until 2001. Then in 2000-2002, a stone sculpture of Cleopatra VII that was part of the collection travelled to Chicago, Rome and London being displayed. The museum's child mummy was sent to Stanford University in 2005 to be studied under CT scans and other types of high-resolution methods of remote sensing, in collaboration between the museum, Stanford University hospital, Silicon Graphics and the NASA biocomputational Lab. At the 75th anniversary of the museum, the results were given with detailed scans and it was covered by Time Magazine in an article on the subject. One of the scanned images won the 2006 Science and Engineering Visualization Challenge 2006. The museum houses a composite copy of an ancient Egyptian tomb, based on photos and sketches that were taken by the order's expeditions to tombs at Beni Hasan, so that visitors could actually feel what it was like to be in the midst of an excavation.